It's that time of year to shift into cozy mode. 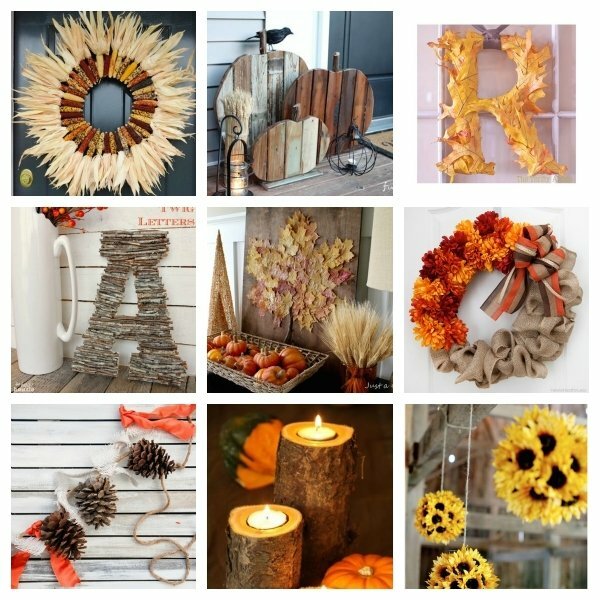 And, for me, cozy goes hand in hand with rustic, so that's the thread that runs through all these fall decor ideas to DIY. We'll start with Krista's cool twig letter project. A wood craft letter, a bunch of twigs, a garden clipper, and your handy glue gun is all it takes to make one. Although Aaron used faux leaves to make her letter, it still looks quite natural. Yvonne's Indian corn wreath is made much the same was as Krista's letter project. Lovely. Reclaimed wood make for some very cool pumpkins. Finding Home Farms tells us how to make them. This sweet pinecone garland project comes to us from Ella Claire. Chris used real leaves to make leaf art. Fall is a popular time to trim trees. Making candles out of the waste it creates is like a great reuse project. Erin made this colorful burlap wreath with faux flowers for less than $20. Tissue paper leaves were decoupaged on to this white pumpkin for great effect! These hanging sunflower balls were made using 7" pre-made sunflower pomanders from Afloral (for $18.99 a pop with a 5 item minimum) and some twine. Of course, making a sunflower ball from scratch would be pretty easy. A foam ball and some faux (or real) sunflower heads and you're pretty much good to go. These are so creative! Can't wait to do the twigs in a big "L" and I am inspired by that autumn wreath, will create a variation for my front door. Great ideas! Thanks for the creative inspiration. Roundup: 20 Festive DIY Wreaths for Fall!